Sustainable Townsville promotes, supports and encourages projects and initiatives from local businesses, individuals and organsiations. Around one-third of the world’s population lives in a tropical climate. Townsville has unique opportunities to adapt to a changing world and develop new and innovate ways of doing things… Sign up to our Sustainable Insights email to get expert tips & advice, learn about how you can make your business sustainable and find out about upcoming Sustainability Events in Townsville! We support and promote our local community. Cooler home, less cost. Just add white. You would not turn on your heater if you feel hot. So why would you install a ‘heat trap’ for your home when you live in tropical Townsville? A dark roof loves excessive heat. It cooks your house and transforms it into a huge furnace. 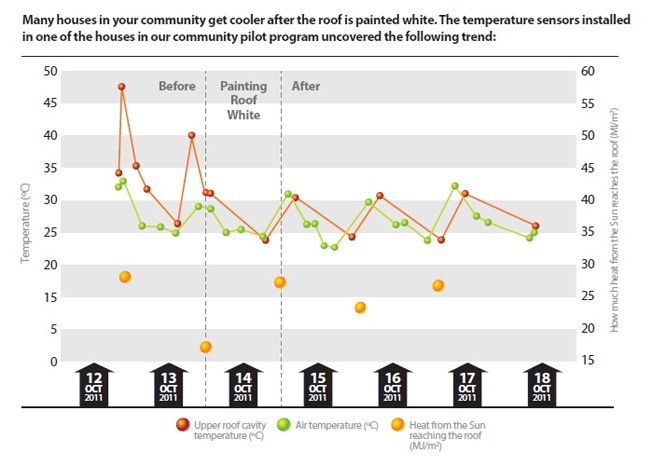 More and more people are transforming Townsville by painting their house roofs with white reflective paint – whether on their new house or as a retrofit to their existing home. You and your friends can become a part of the exciting and innovative White Roofs Townsville Community! The more energy (heat) you block from entering your house, the less energy (electricity) you will use! A white roof can cool your house. But how you feel and perceive the changes matter the most and your perception can affect how much energy you use. This links to an amazing discovery in a Townsville community pilot project in 2011. After their roofs were painted white, residents in the pilot program felt their homes were cooler and more comfortable even with less air conditioning. The energy bill shrunk notably leaving them to wonder how that happened! One home in Townsville reduced its average electricity demand by 57%, with an average across the participating homes of just over 30%. Some of the residents reflected on white roofs and said: ‘we don’t use air-conditioning as much as we don’t need it as much and it impacts our electricity bill’; and ‘Already told several work colleagues – main interest is from the lower power bill’. Townsvillians have uncovered a local living style unique to the tropics! Getting free cooling from your roof, rather than paying for costly air conditioning makes good sense. 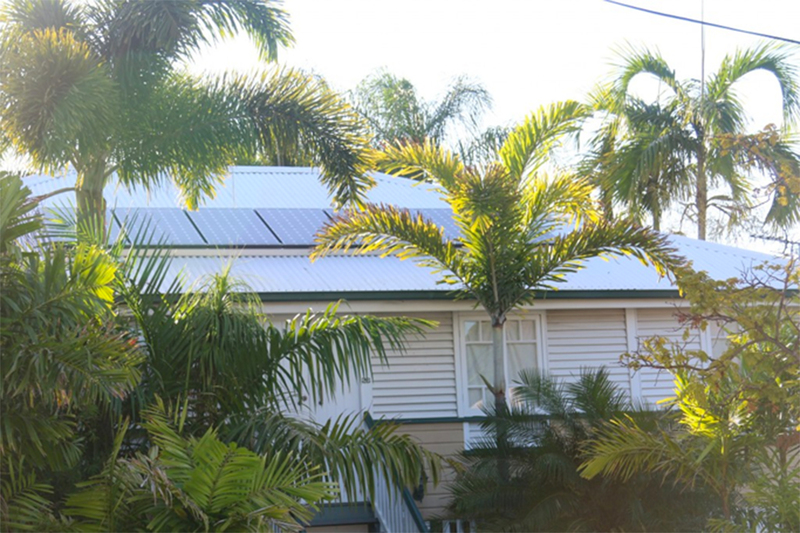 With its high incidence of solar radiation and high year-round temperatures Townsville is the ideal location for white roofs. A white roof will protect your home against excessive heat, compared to a dark or a bare metal roof, especially on days that are over 24°C. On the same day in Townsville a home with a black roof can heat up to as much as 60°C, and the home next to it with a white roof will only be slightly hotter than surrounding air, which is often as much as 30°C less. A white roof will reduce the amount of heat blasting into your house by reflecting sunlight from the roof, and by quickly releasing any heat that might be absorbed. White paint can reflect as much as 80 – 98% of the sun’s heat away compared to red or green paint which reflects around 45%, galvanised steel that reflects around 35%, or dark paint which only reflects 5 – 10%. In technical terms these two processes are called the ‘Solar Reflectance’ (also known as the ‘Albedo Effect’) and the ‘Thermal Emittance’. 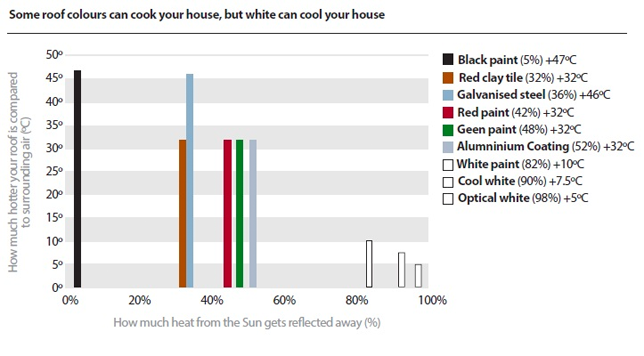 Both of these characteristics are important so look for the white paint with the highest solar reflectance and thermal emittance percentages (sometimes shown on a scale of 0 – 1). Countries around the world are now requiring a minimum solar reflectance of between 65 and 78%, and a minimum thermal emittance of between 70 and 85%. What happens when sunlight hits your roof? It is important to note that ‘Solar reflectance’ is different to ‘Visible reflectance’. 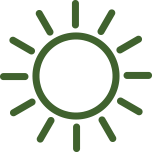 Solar energy is comprised of visible light (around 43%), as well as near-infrared (around 52%), and ultraviolet light (around 4%). High ‘solar reflectance’ implies that all three types of solar energy are reflected. Hence a paint product can have high ‘visible reflectance’ without necessarily having high ‘solar reflectance’. Talk to your local licensed painter about a White Roof coating to find out what is suitable for your home. They will be able to tell you about the solar reflectance and thermal emittance characteristics of the product. Hear what our local community has to say about living with a white roof! I had my roof painted with reflective paint because I was looking for a way to cool our house down without relying on air conditioning. We live in an old Queenslander in West End which is hard to air condition as it “leaks” cool air. I also knew that operating air conditioners was going to get much more expensive over time. I did a lot of research on bulk insulation, foil insulation and the reflective paint options. I discounted most insulation products and companies very quickly as they did not seem to understand the requirements in tropical environments where it is all about keeping heat out of your house. The effect of the paint was dramatic. We used to feel the heat being radiated down from the ceiling which was warm to touch. Now, the inside temperature of the house is quite acceptable and we have reduced our air conditioner use to night time only during exceptionally hot periods. Coupling the white roof with a PV solar system and energy efficient behaviour we have reduced our electricity bills to less than half what they were five years ago despite the huge price increases sine then. Feeling Thirsty For More Technical Information? More technical details can be found in the full report of our 2011 community pilot program. Inspired by an explorer, animal lover, learner, partner, transformer and true giver, the Candia Bruce Sustainability Scholarship is the legacy of the amazing Candia Bruce. Candia was a foundation supporter and philanthropist to many causes including Sustainable Townsville. The scholarship was established by Candia’s husband, Greg Bruce, to honour her legacy. Townsville residents use up to 70% of water on their lawns and gardens, much of this water is wasted due to poor soils, inappropriate application rates from hose end sprinklers and the watering frequency. Overwatering can not only harm your lawn and garden but can also be a large cost burden on ratepayers. 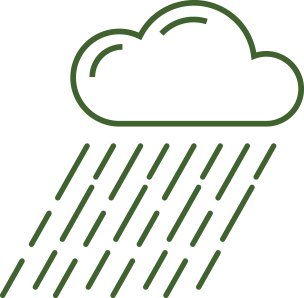 Water running into gutters and drains can cause excessive weed growth and compromise expensive stormwater treatment assets. 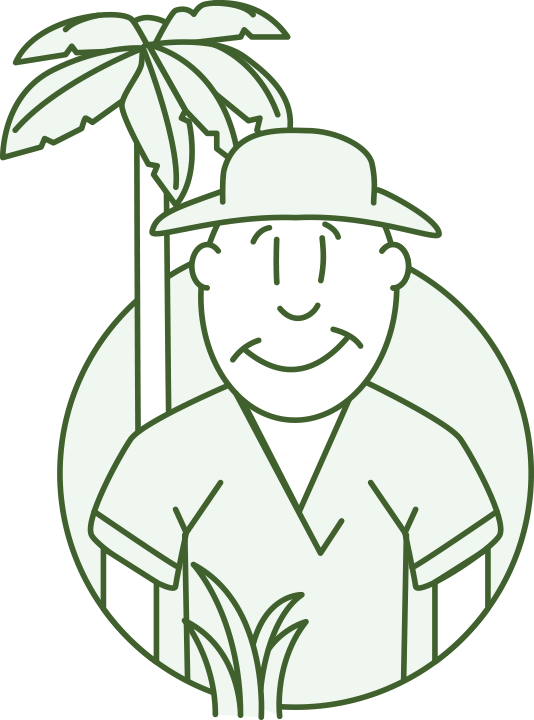 Bradley the Lawn Tamer explains how to keep your lawn healthy with less water with Townsville’s ultimate Lawn Guide. The project brings together leading technologies and expertise from industry, academia and local government. Townsville City Council in collaboration with James Cook University, Taggle Systems Pty Ltd and CoastalCOMS are developing a low cost end-to-end remote water quality monitoring system. Combining cutting edge sensor technology, innovative telemetry, proven analytical and visualisation systems as well as local government expertise in waterway management this project will deliver a vital management tool to Townsville City Council that will assist in the maintenance of local waterways, stormwater treatment assets as well as feeding into the broader potable water management system. The IBM Smarter Cities Programme is a global philanthropy concept by IBM designed for cities to highlight city wide issues that they require assistance with. The Smarter Cities Challenge deploys top IBM experts to help cities around the world address their most critical challenges. We do this by putting teams on the ground for three weeks to work closely with city leaders and deliver recommendations on how to make the city smarter and more effective. Townsville was the first Australian city selected to participate in this programme. When you become a member of Sustainable Townsville, you will be part of a network that believes that working collaboratively makes a difference to the way we see and use our natural resources. When you join as an individual member, you will receive invitations to events and information on sustainable activities happening in Townsville and become a part of the fabric of Townsville’s sustainability network. As a corporate or community group, this membership will allow you to become a part of a sustainability network, offer platforms to engage with other like-minded business and organisation and support the local sustainability movement. How you can take part in improving Townsvilles future. There are many opportunities for you to volunteer for Sustainable Townsville as a brand ambassador. From supporting Sustainable Townsville events to assisting in our communication platforms and spreading the message – Sustainable Townsville is an open and inclusion platform.